Sharing our stories can assist self-validation in surprising and enriching ways. The unlikely hero in this story is a French fry. Diarist friend Karyn was out shopping, browsing in various stores, when a little bird on a small, white wooden plaque caught her eye. 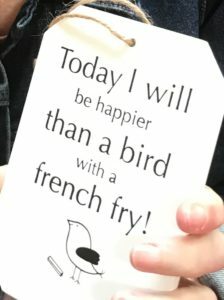 It came with a message: Today I will be happier than a bird with a French fry! Karyn thought: I love this; I am going to get it for June. She felt very happy, although she wondered: What is June going to do with this? When I met Karyn a few days later, she was intending to present this small gift as a surprise towards the end of our visit. However she began to change her mind when I opened our conversation by eagerly sharing something too, which also involved a French fry. 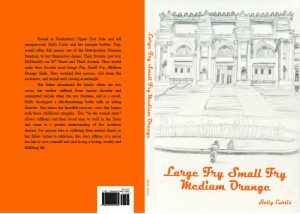 She listened as I enthusiastically described a new book, a story of survival, healing and much more –- Large Fry, Small Fry, Medium Orange – by Holly Curtis. 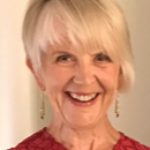 I was recommending Holly’s story as an example of the empowering and liberating outcome that can occur through persevering not only in healing from an eating disorder and other life challenges, but then taking the next step and making the dream of ‘telling my story to help others’ come true. I showed Holly’s book cover to Karyn, describing the significance behind the book title and illustration. Unbeknown to me, Karyn’s heart was beginning to jump up and down. She suddenly could contain herself no longer, slipping her hand in her shoulder bag and withdrawing a small brown parcel. She passed the package across the table saying: You have to open this! Now! Karyn is rarely so forthright so I immediately began to open the brown paper package. You must send this on to Holly, she said. By now I was very curious but as I lifted the small plaque from its wrappings and read its message, I felt excited too. We had each arrived for our catch-up with the same word, “fry”, on our mind. We each had a story for different reasons to share about this three-letter word. How powerful is that, I thought. We discussed this little word, a word that is often filled with dread and the bane of anyone with an eating disorder. The ”fry” was suddenly a star, a little story hero. We were both excited at how the humble “fry” had portrayed and provided an illustration of how, through small acts of sharing and of kindness, great things can happen. 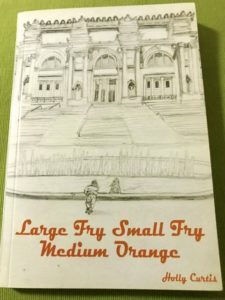 The happiness and validation that Karyn felt in wrapping the little bird with the French fry for me, and the happiness I felt in sharing the story about Large Fry, Small Fry, Medium Orange with Karyn, was multiplying. Time and time again, I witness and experience such tiny doses of validation as a reward for seemingly small acts that mean so very much. Karyn calls these rewards little miracles because they occur unexpectedly; they come only when you are not looking. Such blessings come in many forms; they validate, assure us like a pat on the pack that we are doing okay, we are worthwhile beings; they keep us going. 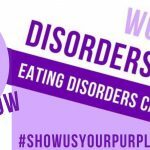 Holly, Karyn and I all have experienced the eating disorder anorexia nervosa. We each have found that when we bravely do something that confirms, validates and reflects authentic self, when we do what feels right and trust our innate self and our first true thought, then this is when these little surprise awards appear, as if to say ‘well done, you are traveling in the right direction; we will push aside the next boulder on your healing path for you’. And recovery takes a leap forward. Karyn’s initial thought was that she would be happy if I hung the little bird in my bathroom, but to learn of Holly’s book title and the story behind it, made her heart sing, and this is why she gushed: You must send this on to Holly. Karyn had not heard of Holly before but immediately she knew this gift was for her. I share this story to illustrate how the layers and depth of the love, the joy, the validation and self-confirmation increase through sharing our stories. As I write, the little plaque is soaring, with its message relating to bird and book, across the ocean from Australia to Holly in the United States and, through this diary entry, is spreading to you, too. Such is the power of story-telling. Do you have a story of serendipity to share? I encourage you to contact me, and share through the comment section below. 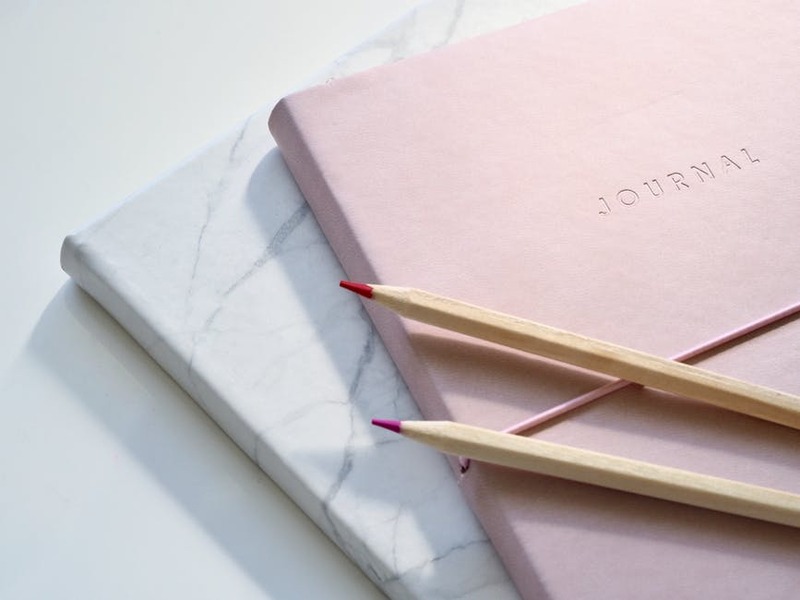 • What was your motivation for writing your story? I wrote my memoir to help sufferers feel totally understood and to inspire them to keep fighting for their recovery. I always wanted families, friends and loved ones to know the mindset of an eating disorder individual so they could create the best environment and relationship to help the sufferer achieve recovery. • How did you feel while writing your book? Best time? Worst time? 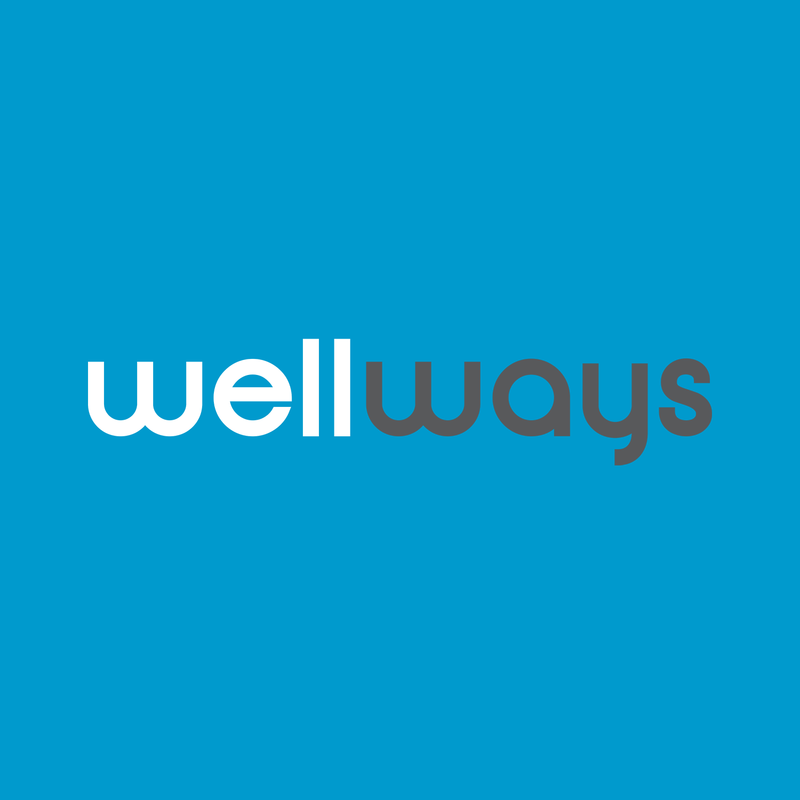 I felt my best and most excited about writing my book when I wrote out the important boundaries that need to be set between a sufferer and their loved ones so not to trigger them or shame them. I felt my worst and most anxious when I recalled the darkest points of my eating disorder. It made me feel deeply sad for that little girl. • What has been the outcome since releasing your book? The outcome of releasing my book has been extraordinary for me. I have always lived a very public life, yet never shared my best kept private secret … my battle with a life threatening eating disorder. I put my memoir out in highly exposed venues and have received overwhelmingly glowing reviews of my bravery, honesty, tenacity, survivability and my undying heart that chose love to heal my pain. Most important I am receiving so much gratitude from current sufferers who really identify with my memoir and my story helps their loved ones and friends understand their eating disorder struggle so much more. What have you learnt through the process of writing your story? Writing my memoir has affirmed my recovery and that I can revisit my painful past and feel such gratitude for all the love and amazing things that have happened in my life since then. I actually experienced sadness then immediate joy when writing and remembering that sad little I was because now I had so many happy things to tell her. 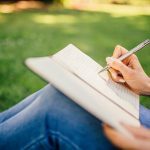 What resources/guidance/inspiration did you draw on to achieve your book writing ‘Everest’? My daughters inspired me to write my book. They are now 19 and 26 and I could not be a prouder mother. I did the hard work it takes to be a good mother and raised respectful, confident and loving daughters. If I did not fight for love in my life or my recovery I would have missed out on this greatest gift of my life. Love always wins! How do you feel now, and what message would you like to give to others who would like to write their story? Writing my story and sharing it with the world has been exhilarating. I never knew the joy and satisfaction I would feel from writing my memoir. I look at my book and smile at it as if it is my new best friend forever. Two years I worked on my book every chance I could. Many times I wanted to give up because I did know if my writing was good enough to tell a powerful story. So my advice to anyone who has ever desired to write your story … DO IT … DO NOT DOUBT IT. You never know how many people you will touch by your story. Curtis, Holly. Large Fry, Small Fry, Medium Orange. John S. Swift Co., Inc. Printing, Chicago, Illinois, 2016.